It was around the same time last year, we starting seeing MLB The Show 18 news come in. Today, the official Twitter account has teased some news on MLB The Show 19, coming tomorrow. If it’s anything like last year, we could see a trailer from MLB The Show 19, or maybe just an announcement of one coming soon. We could see the Twitch stream schedule of events, maybe some gameplay and screenshots. It’s anyones guess. Could we see the cover athlete, Bryce Harper, announce the team he’s going to sign with and reveal the official cover? Not going to lie, that would be dope. UPDATE: MLB The Show 19’s facebook page reveals that it could very well be gameplay related. Trailer, gameplay video, both? We’ll see soon enough. Either way, at this point, any news is good news. What are you hoping to see tomorrow? Wouldn't be surprised if it is the actual announcement of where Bryce Harper will sign. 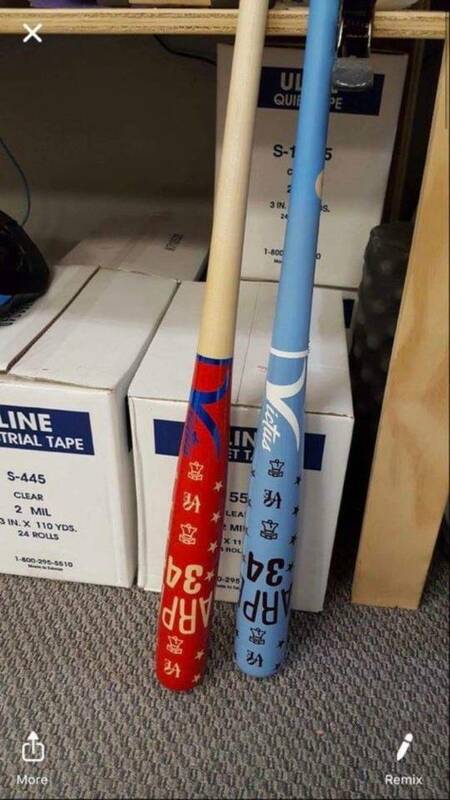 He has been sending out cryptic tweets and the Phillies front office sent out tweets of some bats of his. So we'll see. I'd be pretty amazed if they let them do that, they'd surely want to break the news themselves? I hope it's something revealing, I've been tweaking over here. (via their official facebook page) Updated OP. These are in the Phillies clubhouse right now. Hope we'll see a schedule of what we'll know and when, but any news is good news at this point. The suspense is killing me. I really hope he chooses Philadelphia. Would be quite the coup for SDS to get exclusivity to break the Bryce Harper signing news. Roy Halladay wore number 34 and the Phillies retired it for 2018 season. If it's still retired then I guess Harper is going to have to change his number if indeed he signs with the Phillies. So those Bats will need to be updated I guess. I really don't think SDS will be the one to break Harper's signi but they would most likely be on hand when that news does come down. They'd just be ready wth their own news release at the same time. At least that's what seems logical to me. It's not still retired. Was only for 2018. I dont understand, who only retires a number for a year? Retired is the wrong word. They didn't use it last year out of respect for Halladay passing. What are we thinking trailer or Twitch schedule? Didn’t a trailer come out first last year with hidden details of improvements? Expanded minors! Short A and A added, with a longer draft too. Bryce Harper to host 2 hour Twitch stream of radically improved franchise mode? Bryce Harper to host 100 pack opening on Twitch, unveil own DD card? What irony Harper doesn't even have a team yet LOL so what is he gonna wear? He's gonna wear the MLB The Show free agent garb. It wouldn’t be just short A it would be a fully funtional minor league system, instead of the half baked one they have now, with the potential for a proper general management element the game has been sorely lacking. Considering the popularity of the GM aspect of MLB, I would not under estimate the value of such an addition, and it’s puzzling why it hasn’t been added already. If Diamond Dynasty keeps raking in $$, there's a reasonable chance the studio expands and can afford to hire more developers. this year I am worried for the first time. the last couple of years it's all been about DD not franchise. which is like that Ultimate team garbage. I can play fantasy football or baseball for free online with fake cards if I wanted too. So I am anxious to know what is new in franchise if anything is new at all, I must say that if nothing is new in franchise at all this year a if I was to buy the game my honest answer is I would buy it for a roster update just so that rookies of 2018 are not rookies of 2019 anymore etc. Some rumors floating that Vegas has pulled all prop bets for Harper in the expectation of a signing tomorrow. This page has been ahead of several breaking news signings in the past. It'd also be a great addition to Road to the Show. A true journey from A ball to the Majors. I've really hated starting in AA it's unrealistic. I’m thinking we get a trailer that may disclose a nugget or two in regards to changes (2 way players :)) and then they will show off Harper at the end in a Phillies uniform. It was never actually "retired" in any official capacity. Andrew Knapp who wore 34 the previous year agreed that he wasn't going to wear it for the 2018 season and changed his number. With all due respect, as far as my interest in getting info the MLB 19, I could not care less where Harper signs. IF this is their big reveal, it's pretty freakin' weak. Agreed. They could put artwork on the cover for all I care. The package has no relation to the content. They just tweeted the trailer is coming February 5. Go back to your lives, citizens. HAHAHAHAHAHA!!!! LMAO...LOL. The hubris and the audacity to say this was a gameplay announcement. So it was a trailer...for a fn trailer? ... so the next trailer gonna be a trailer for DD? Well.... that was a lame trick.